Purchase orders are often used for government agencies or large businesses. Rather than paying directly on the site with a credit card, they make a purchase order - which is essentially an 'intent to purchase'. 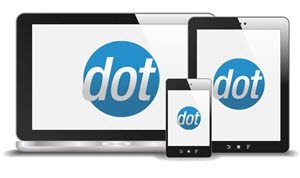 Once the order is placed, the store owner must send the customer a formal purchase order document (not generated by the software), and the customer sends payment however is agreed upon. 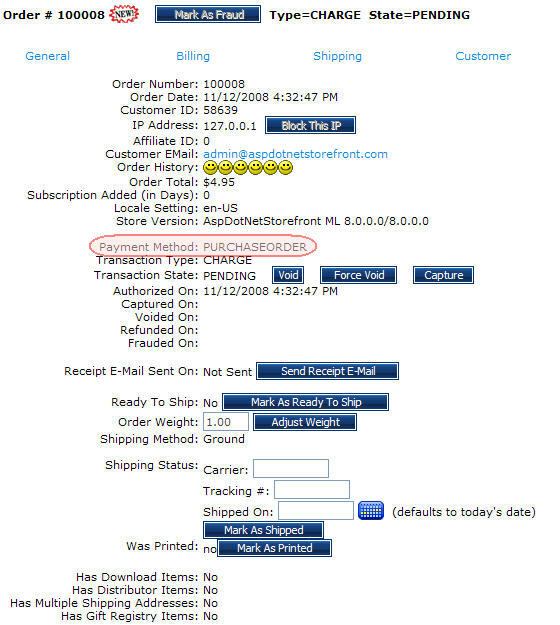 Once that payment is received, the store admin can mark the order as paid. Most of the order processing is handled outside of the software. 1 - To use "Purchase Order" as a payment method, in the admin site, go to Configuration → Site Configuration Wizard and check the box beside Purchase Orders or add 'Purchase Order' (no quotes) to the PaymentMethods AppConfig. 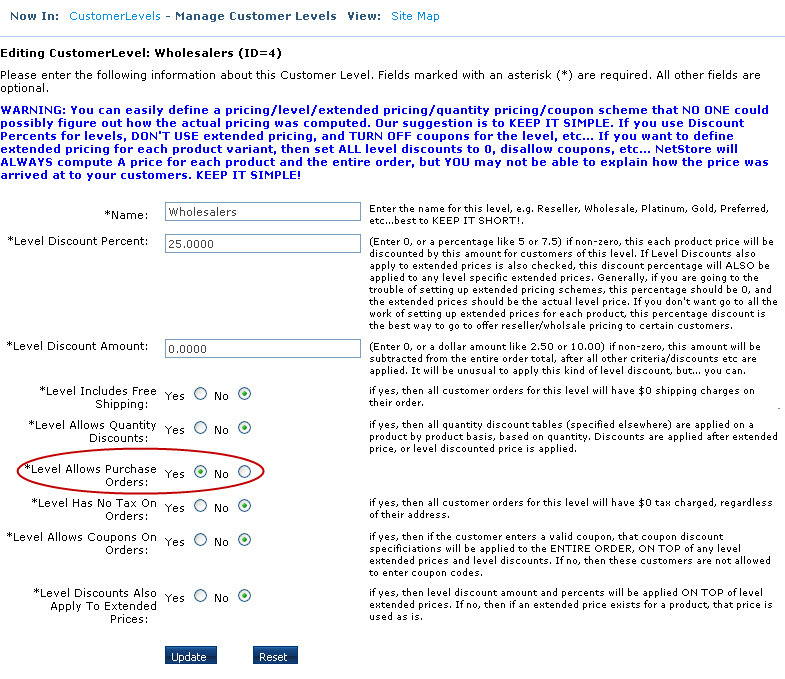 2 - If you want to restrict the customer level that can use Purchase Order as payment, it can be configured in the customer level, go to Users > Define Customer Levels. Choose “Yes” in Level Allows Purchase Orders. This will only affect the particular customer level that you are configuring, so this must be set for each customer level. If this is set to “No”, even if you enable it in the Config Wizard, it will not show up in the choices for payment method. But if a customer does not belong to any customer level, then purchase order will be included in the choices of payment methods. 3 - It will then be shown in the Payment Info page as one of the payment methods. If the customer has a PO number that they want the store admin to use (or that the store admin has provided), they can enter it. This value isn't used by the software to do anything, it is simply recorded on the order. 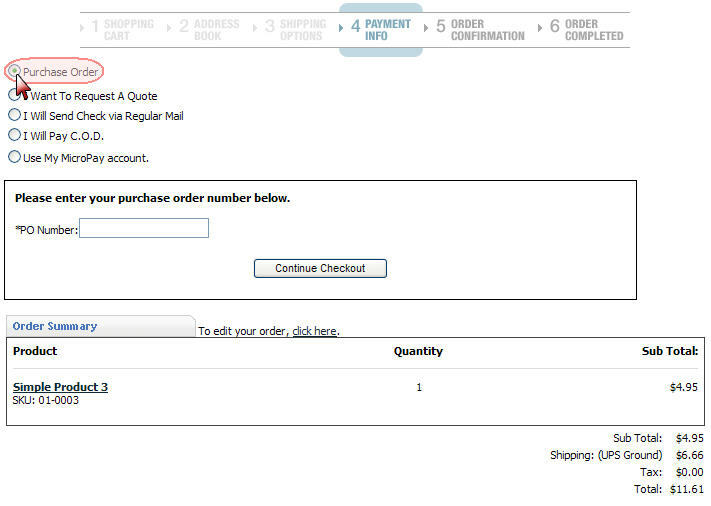 4 - A confirmation message will be displayed after placing the order. 5 - It may now be viewed by the admin in Orders > View/Manage Orders. You will notice that "PURCHASEORDER" is the payment method indicated.